This is a unique opportunity to join a fast-paced, early stage, global health nonprofit that is transforming healthcare in low- and middle-income countries. Expand your knowledge of global health and developing country issues, connect with leading experts in the field, and acquire skills in research, analysis, administration and project management. This is an exciting opportunity with an organization seeking to change the global health sector. Aceso Global (www.acesoglobal.org) is a Washington, D.C., nonprofit that provides strategic healthcare advisory services to strengthen health systems and achieve affordable, high quality healthcare in low- and middle-income countries. We advise governments, insurers, foundations and nonprofits in diagnosing problems, devising solutions, and creating value in hospital and healthcare networks. Aceso Global undertakes research, analysis, and data collection to drive learning and collaboration across the global health community. Our work informs policymaking, healthcare investments, hospital financing and front-line integrated care improvements. Check it out in Handshake here. This entry was posted in Midd Blogosphere and tagged Finance, Consulting, and Business, Government, Law and Policy, Uncategorized on April 5, 2019 by Timothy Mosehauer. Read more in Handshake here and apply now! A hands-on day of learning for anyone participating in international cohorts or social impact-related summer experiences or research. Participants will explore the ethics of engagement through multiple lenses and will leave with a toolkit of culturally-appropriate strategies for maximizing your summer experience. Presented by faculty and staff of the Middlebury Experiential Learning Centers. This entry was posted in Midd Blogosphere and tagged Arts, Media, and Communications, Education, Finance, Consulting, and Business, Government, Law and Policy, Health Professions, Science and Technology, Social Impact, Uncategorized on April 3, 2019 by Nicole Veilleux. That’s how college students describe MiddCORE: a four-week summer program for current college students and recent graduates who want to develop the SKILLS, EXPERIENCE, and CONFIDENCE to be successful in life and work. MiddCORE is a residential program where students live on the beach at Asilomar and classes are held at Middlebury Institute of International Studies at Monterey June 1–29, 2019. Through an intensive daily schedule of small-group classes and mentor-led workshops, students develop skills in innovation, strategic thinking, and leadership. The program is highly collaborative and hands-on, and students work closely with each other and more than 50 mentors from the top leading fields and professions. To better understand MiddCORE check out the brochure, coursebook, alumni outcomes, and follow on Instagram. This entry was posted in Midd Blogosphere and tagged Design thinking challenge, Education, Failing forward, Finance, Consulting, and Business, Government, Law and Policy, Innovation, leadership, Social Impact, Uncategorized on April 1, 2019 by Tracy Himmel Isham. Please join the Professors of the Practice Business and Enterprise Program, Center for Careers and Internships, and Middlebury Women on Wall St. on Wednesday, April 10th to welcome John Waldron ’91, President and Chief Operating Officer back to campus. Registration is required to attend the following events. John Waldron is president and chief operating officer of The Goldman Sachs Group, Inc. He is a member of the Goldman Sachs Management Committee and chair of the Firmwide Client and Business Standards Committee and Firmwide Reputational Risk Committee. Previously, John was co-head of the Investment Banking Division (IBD) from 2014 to 2018. Prior to that, he was global head of Investment Banking Services (IBS)/Client Coverage for IBD and had oversight of the IBS Leadership Group, a group he founded in 2010. Earlier in his career, he was global co-head of the Financial Sponsors Group from 2007 to 2009, co-head of Leveraged Finance from 2005 to 2007 and co-head of the Media and Entertainment Group in IBD from 2002 to 2005. John joined Goldman Sachs in 2000 and was named managing director in 2001 and partner in 2002. John is a member of the Executive Committee of the Board of Trustees and chairman of the Trustees Committee of The Lawrenceville School. He is also a member of the Executive Committee of the Board of Directors of Lincoln Center for the Performing Arts in New York City, a member of the Executive Committee of the Board of Directors for Big Brothers Big Sisters of New York, co-chairman of Youth, I.N.C., and a member of the Council on Foreign Relations. John graduated Phi Beta Kappa from Middlebury College with a BA in English in 1991. This entry was posted in Midd Blogosphere and tagged Finance, Consulting, and Business, Uncategorized on March 29, 2019 by Ursula Olender. Here’s a great opportunity for you to participate in investing through this unique contest where YOU and Middlebury College could win CASH PRIZES. This is a month-long competition from April 1 to May 3, 2019. 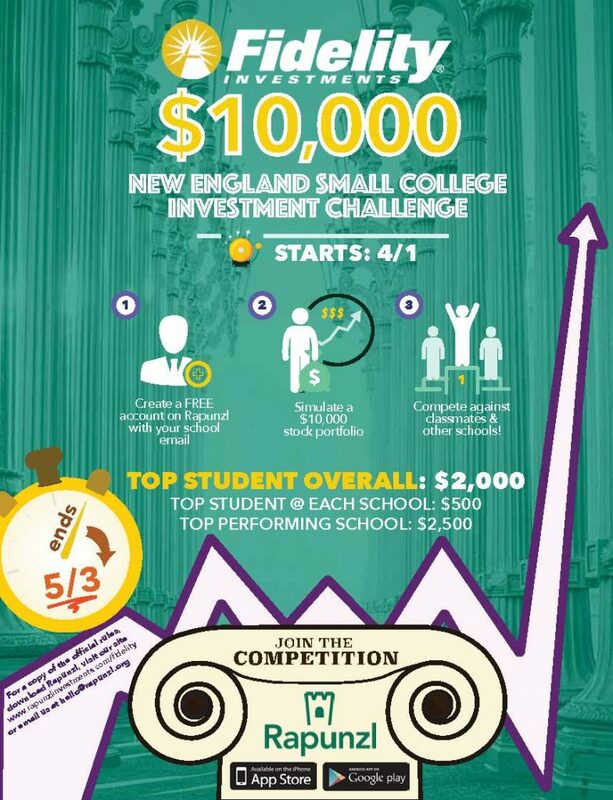 The top performing student portfolio at each of the 11 participating colleges will receive $500, the top overall performing student portfolio wins $2,000 and the top New England Small College wins $2,500 thanks to the sponsorship of Fidelity. Rapunzl was co-founded by an Amherst College alumnus who created this investment education platform which is part of the Chicago Public High school curriculum. As a NESCAC alumnus, he wanted to bring this fantastic opportunity to the New England Small Colleges as a way to help students learn about investing in a fun and collaborative way. This entry was posted in Midd Blogosphere and tagged Finance, Consulting, and Business, Uncategorized on March 28, 2019 by Ursula Olender.